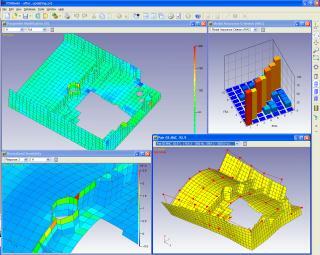 This page includes a collection FEMtools screenshots showing different types of applications in different industries. More screenshots can be found on http://www.femtools.jp/products/screen.htm. 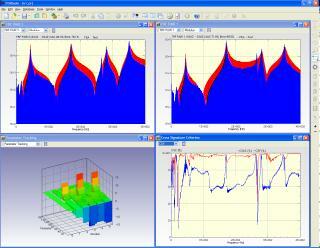 Modal correlation and sensitivity analysis of an engine block. Model courtesy by PSA, France. Modal correlation and updating of an engine block using superelement techniques. 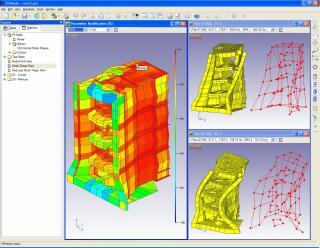 Updating of stiffness parameters using experimental static displacement data. Model courtesy by Rolls Royce GmbH, Dahlewitz, Germany. Updating of physical element parameters and modeling of damping using Frequency Response Functions (FRF) directly. Identification of distributed pressure forces in a muffler cavity based on measurements of operational deflection shapes (ODS) at the outside surfaces. 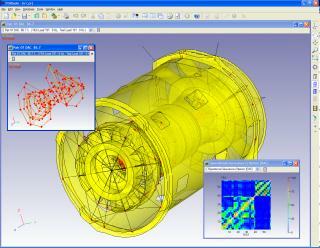 Measurements were done using a laser scanning device. Model courtesy by FAURECIA, France. 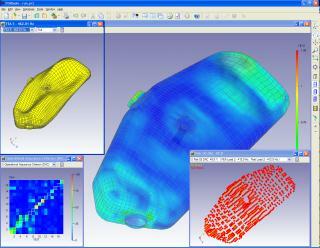 Validation of hard disk modeling revealing too coarse meshing of corners. 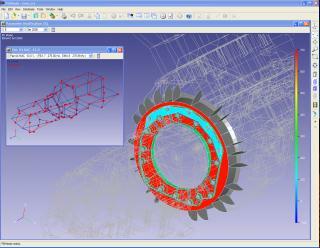 Model courtesy by MSC.Software Corp., Los Angeles, USA. 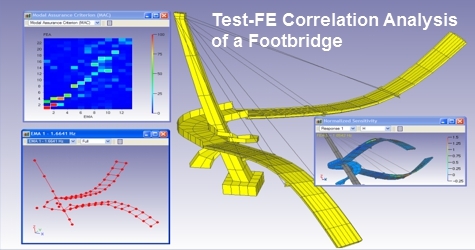 Correlation of FEA with test data and sensitivity analysis of a footbridge. Model courtesy by EMPA, Dubendorff, Switzerland.